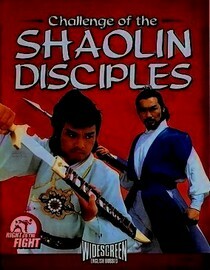 Challenge of the Shaolin Disciples (click here to add to your queue) is your standard, run of the mill, bad editing and worse voice-overs kind of kung-fu. I enjoy it, but it's not for everyone. The editing in this one was particularly bad but it had some comedic relief, good characters and decent fight scenes. If you're into kung-fu movies or are a film professor looking for a film to showcase how to NOT edit a movie have a look. If not, let Bruce Lee introduce you to kung-fu. He's amazing and on Netflix. Why is it in your queue? Because I like kung-fu movies. Is it artsy? Quite the opposite. Best thing about the movie? The characters were fairly well developed for one of these kinds of movies. What mood should I be in to watch this movie? A good mood with a sense of humor about poor editing. The only bad/good movie of that type that I've seen is Shogun Assassin and I loved it just because I am a Wu Tang Clan fan. I like some of the modern ones like Kung-Fu Hustle but I know it's not even close to the same thing. Ha! I actually tracked down that movie because of Liquid Swords and it didn't disappoint.